If it wasn't made clear previously, it's now undeniably apparent that the Hellboy reboot will be ultraviolent. The franchise has been collecting dust for a decade, ever since Guillermo del Toro released Hellboy II: The Golden Army in 2008. Lionsgate is hoping to revive the character for modern audiences in the hopes of kick-starting their own R-rated comic book franchise. Now, star David Harbour (Stranger Things) reveals that his take on the character is going to be even more violent than we previously expected. 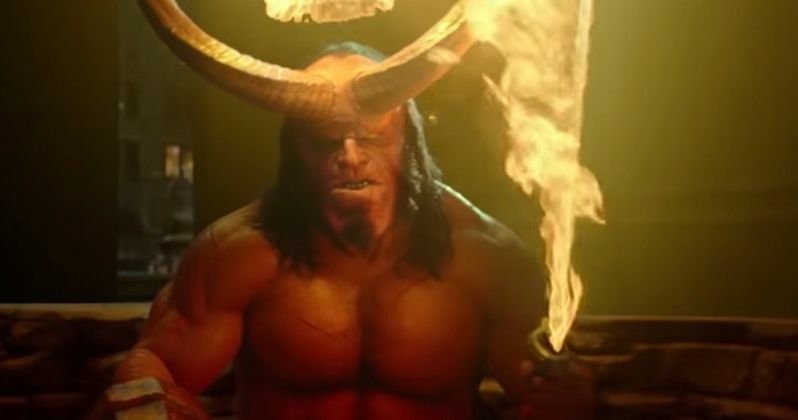 We recently got our first look at the Hellboy teaser trailer which was surprisingly light and fun in tone. But still, behind that playful tone was a whole lot of monsters and violence just waiting to happen. In a new interview, David Harbour reveals that this new Hellboy is going to be taking actual blood baths, chopping off heads and more. Here's what he had to say about it. "There's really a sense that you're actually killing things, even if they are giants or monsters. You're chopping their heads off, you're bathing in their blood and you're feeling the complex feelings of actually cutting the heart out of another thing. We're taking the time to deal with the fact that Hellboy is a killer. He's a weapon." It's one thing to say a movie is going to be a bloodbath, but to have the titular character actually take one? That's on another level. The Guillermo del Toro movies weren't shy about showing off Hellboy's powers and there were monsters aplenty. But in this case, the idea of graphic violence and the results of those actions are going to be focused on more heavily. Director Neil Marshall, who is no stranger to violence, having previously helmed The Descent and several episodes of Game of Thrones, previously indicated that we were going to be treated to lots of blood and gore in this R-rated take on the Dark Horse Comics character. Deadpool kicked the door wide open for other studios to experiment with R-rated comic book movies, which had previously been viewed as an unsafe bet. Both Logan and Deadpool 2 further proved that an R-rating doesn't have to mean less success at the box office. Hellboy creator Mike Mignola worked on the screenplay for the reboot alongside Christopher Golden, Aron Coleite and Andrew Cosby. Sometimes having so many credited screenwriters can be a bad sign but, so far, there isn't necessarily reason to think that's the case here. The cast also includes Ian McShane as Professor Trevor Bruttenholm, Sasha Lane as Alice Monaghan, Penelope Mitchell as Ganeida, Daniel Dae Kim as Ben Daimio and Milla Jovovich as the villainous Blood Queen. Even though he didn't show up in the trailer, it's also been reported that Thomas Haden Church will be portraying Lobster Johnson in the reboot. So it's also going to be a bit weird, in addition to bloody. Hellboy is set to arrive in theaters on April 12, 2019. This news was first reported by Empire.